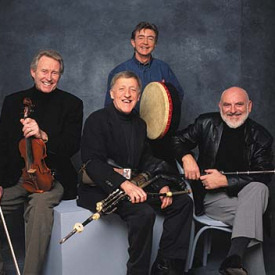 With a career that spans four decades and forty albums, The Chieftains are not only Irelands premier musical ambassadors but also the most enduring and influential creative force in establishing the international appeal of Celtic music. Paddy Moloney, the groups founder and front man, first brought together a group of local musicians in Dublin in 1962, fashioning an authentic instrumental sound that stood in sharp contrast to the slick commercial output of most Irish music at the time. The groups first four albums, recorded between 1963 and 1974, established their worldwide reputation even as the group continued to perform on a semi-professional basis. In 1975, The Chieftains recorded the soundtrack to Stanley Kubricks Barry Lyndon, featuring the hit single Women Of Ireland and for which they won an Academy Award. Continued extensive touring followed, further establishing them as a major concert attraction and a string of subsequent albums, including such standouts as Bonapartes Retreat, Boil The Breakfast Early and Chieftains in China, enhancing their status as Irelands premier musical export. In 1988, they joined forces with fellow countryman Van Morrison on Irish Heartbeat which began an historic series of collaborations including recordings with James Galway, Jackson Browne, Elvis Costello, The Rolling Stones, Sting, Tom Jones, Sinead OConnor, Linda Ronstadt, Los Lobos, Ry Cooder and many others. They also continued their acclaimed work in soundtracks, on such films as Treasure Island, Tristan And Isolde, The Grey Fox and Far and Away. In 1992, they recorded the double Grammy-winning Another Country, with performances by such country and bluegrass stars as Emmylou Harris, Ricky Skaggs, Willie Nelson, Chet Atkins and Don Williams. Six-time Grammy winners and eighteen-time Grammy nominees, The Chieftains maintain an international touring schedule that has brought them before literally millions of fans on every continent. Their current 40th anniversary celebration has included sold out performances in North America, Europe and Asia and in March, 2001 they played a tribute performance for rescue workers at Ground Zero of the World Trade Center. They returned to Nashville in 2002 for DOWN THE OLD PLANK ROAD, their 40th career album, featuring such special guests as Vince Gill, Lyle Lovett, Earl Scruggs, Alison Krauss, Martina McBride and others. The album has received two nominations for the Grammy Awards - "Best Contemporary Folk Album" and "Best Country Instrumental Performance". Sadly, in October 2002, one of their founder members Harpist, Derek Bell passed away suddenly. The Chieftains Official website is a lasting tribute to his memory. Comments: The Chieftains are our featured artist! Want to write a review about Chieftains's music? Or perhaps you would like to share your experience of seeing Chieftains in concert. Feel free to use the following form to post your reviews, comments and thoughts concerning our featured artist! Please login to write your comments about Chieftains.